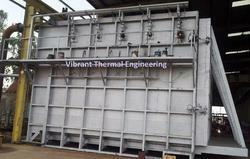 We are the best known manufacturer and exporter of the high quality of Stress Relieving Furnace. We provide versatile types of Stress Relieving Furnace and many more items having standard quality and high efficiency which are manufactured by our team of engineers and other skilled and unskilled work forces. We are specialized in making best quality-approved packing under the guidance of our reliable Engineers within affordable prices with on time deliveries.